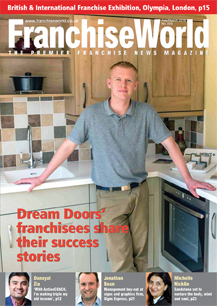 View the Feb/March 2018 issue of Franchise World magazine online now! The BFA has appointed its new board of directors and chairmen for its forums for the year ahead. Four new board members were appointed, three full members and one associate member. The boutique-style fitness studio, YourZone45, is to accelerate its growth strategy with a target to open 12 studios by the end of the year. The British & International Franchise Exhibition brings business opportunities to suit all skills and aspirations to London’s Olympia on the 9th and 10th of March. Domino’s online sales in the UK grew by 14.5 per cent year-on-year as the trend for combined ordering with family entertainment continued to deliver, resulting in its system wide sales increasing by 18.2 per cent to £321.8m. Signs Express, the signs and graphics franchise, have marked the conclusion of 25 years in franchising with a management buy-out led by its finance director, Jonathan Bean. The multi-site crêperie UK brand, Crêpeaffaire, has secured investment from the Business Growth Fund (BGF) to accelerate its new site rollout. Sandstone Yoga and Pilates, founded by senior yoga teacher, Michelle Nicklin in Aldridge, West Midlands, has welcomed Louise Tonge as its first franchisee covering Sutton Coldfield. The Australian hairdressing brand, Just Cuts, has launched in the UK and has opened its first kiosk salon at the intu Lakeside shopping centre in Grays, Essex. Carl Reader of d&t accountants discusses the very clear advantages of business-format franchising and potential disadvantages, as it is a system that is not necessarily right for everyone. Heights Farm Premium Pets Foods, a family-run business based in Bolton, Lancashire, has launched its home-based pet food delivery franchise. The company says its hypoallergenic products are based on locally sourced fresh ingredients. Brian Duckett of The Franchising Centre talks about how the franchise manual has evolved and how it should be used more by the franchisee, as the ‘good’ franchisor will continually update its manual. Robert Turner, of Bird & Bird, says it is essential that franchisors ensure that its terms and conditions/contracts comply with, what over the last five years, has become an increasingly complex area of law. Nicola Broadhurst of Stevens & Bolton discusses the two main types of property lease in a premise-based franchise and highlights the advantages and disadvantages of each type of lease.